In my work at the New York City Department of Parks and Recreation, and more recently with the Trust for Public Land, I have been fortunate to be involved at the nexus of landscape architecture, civil engineering, urban design, environmental management, park planning, and many related areas. Over the last decade, but particularly over the last five years, the concepts of sustainable design and its sub-genre, green infrastructure (GI), have entered into the design, construction, and renovation of parks. At the same time, many cities in America have taken on the challenge of managing storm surge, storm water runoff, water conservation, and water pollution reduction, increasingly through the use of green infrastructure. That challenge has become even more urgent with the advent of global climate change, and the more frequent and intense storms that have accompanied it. Many cities face fiscal constraints that don’t allow them to build new parks, but are nonetheless obligated to manage water better—even to the point of creating major new infrastructure to protect themselves from catastrophic damage from storm surge, flooding rivers, and other damaging weather events. Parkland in U.S. cities makes up between 2.3% and 22.8% (with a median of 9.1%) of city land area. With the opportunity to build new, functionally layered landscapes that serve to process storm water, abate storm surge and serve as esthetic and recreational assets, parks and green infrastructure may be entering a prolonged, perhaps permanent, symbiotic relationship. As to the question of whether green infrastructure can always be counted as a “park,” the short answer is no. But properly designed, constructed, and managed, GI can be a park, especially under broader definitions. For example, the 2,000 Greenstreets (i.e., greened traffic islands) created by the City of New York, prior to their being formally engineered as GI, were considered “parks” by the Parks Department. They were mostly very small properties, but what they had in common was plants and trees, and often sidewalks and sitting areas or benches. They played a small role in lowering the urban heat island effect, absorbing carbon dioxide and particulate matter, providing oxygen and habitat, and creating many small islands of beauty in otherwise bleak landscapes. Perhaps the “mother of all GI” in New York City was the first “Bluebelt” in Staten Island, designed to capture, filter, and slowly release storm water runoff. In Atlanta, the spectacular new Old Fourth Ward Park is a major new GI installation, and very definitely a public park. 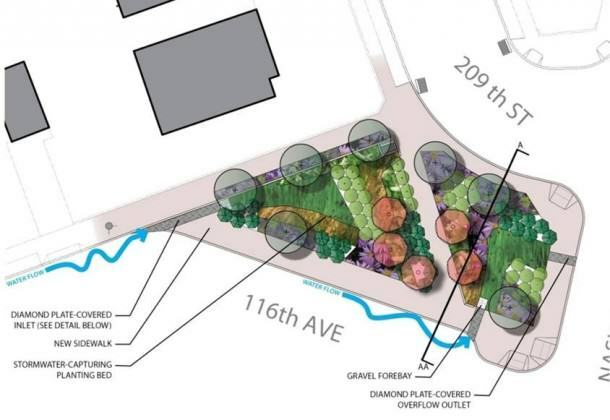 Finally, existing (“regular”) public parks can have new GI elements added to them, and new parks can contain significant GI elements (as will be detailed later in this article), and in a sense all parks that have significant green open space that absorbs storm water runoff can be looked at as a form of GI. The definition used by the New York State Department of Environmental Conservation is more specific, but also perhaps too circumscribed, defining GI as “a variety of site design techniques and structural practices used by communities, businesses, homeowners and others for managing stormwater.” On a larger scale, green infrastructure includes preserving and restoring natural landscape features (such as forests, floodplains and wetlands), and reducing the amount of land covered by impervious surfaces. On a smaller scale, GI practices include green roofs, pervious pavement, rain gardens, vegetated swales, planters and stream buffers.” Others suggest that true GI is not engineered or “built,” but is “natural” and in its simplest form consists of trees, plants, and soil. Even among my colleagues at the Trust for Public Land, there has been a healthy debate about the meaning. Some favor the tighter definition that relates primarily to storm water management. But an argument can be made that natural systems, such as salt marshes, can provide a GI approach to storm surge abatement, and that conserving land around drinking water and watersheds to avoid pollution and the resulting need to build hugely expensive drinking water filtration plants would also constitute a kind of GI. Consider also that a medium-sized tree can absorb over 2,500 gallons of rainwater per year, and a riparian forest in the Chesapeake Bay watershed was shown to remove 89% of nitrogen and 80% of phosphorous before it reached the water. However you choose to define it, GI is quickly becoming a major tool in designing and building sustainable cities, and increasingly as a way to both improve park design, and have GI function as parks. 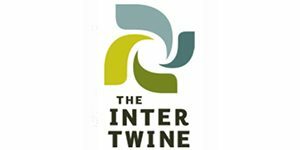 What follows is neither an encyclopedic nor scientific survey, but rather a highly personal and anecdotal tour of where and how GI and parks are coming together across the US (there is also a great deal going on with GI in cities around the world, but that may be a subject of a future installment). I hope the readers will forgive a focus on projects in New York City and those in other cities being done by the Trust for Public Land, as those are some of the projects I know best. By the broader definitions, parks have been part of GI systems since they were first created. Frederick Law Olmsted and Calvert Vaux captured storm water in an intricate system of underground drainage tiles and pipes, and directed it to the lakes and ponds in their earliest parks in the mid-late 19th century. In Boston’s Back Bay Fens, an early version of GI was first used to clean polluted waters using natural landscape typologies. But for the most part, the 20th century saw an approach to storm water that sought to get it into storm sewers as quickly as possible. The prototypical urban playgrounds of New York and other cities featured huge areas of impermeable asphalt pitched to drain the water into sewers, and even sports fields were designed to drain away as much of the water as possible. That water carries damaging pollutants into water systems, causing combined sewer systems that serve more than a quarter of major U.S. cities to overflow. And when they do, they discharge sewage waste and high levels of phosphorous, pesticides, increased concentrations of a host of metals, including mercury, nickel, chromium, lead, and zinc, as well as organic contaminants such as PCBs and PAHs. However, in recent years, landscape architects, ecologists, and horticulturists have taken a new look at park design, seeking to make parks more sustainable. Among the primary ways to make a park more sustainable was to reduce impermeable surfaces and capture the storm water runoff in enhanced and enlarged landscapes. The American Society of Landscape Architects, following the lead of LEED, worked with the Lady Bird Johnson Wildflower Center at The University of Texas at Austin and the United States Botanic Garden beginning in 2005 to develop the “Sustainable Sites” and rating systems for sustainable landscape design. And in an unusual partnership, the New York City Department of Parks and Recreation and the non-profit Design Trust for Public Space worked with professional peers beginning in 2008 to develop and publish guidelines for building sustainable parks, “High Performance Landscape Guidelines: 21st Century Parks for NYC.” Charles McKinney (a longtime planner, designer and administrator at NYC Parks) and Deborah Marton (then executive director of the Trust) led a team of “fellows” and peer reviewers in developing guidelines for the design and construction of sustainable parks and public spaces, with a focus on storm water management. At the same time the guidelines were being developed, some cities were taking macro approaches to sustainable urban development, including Seattle, Portland, New York, and Philadelphia. 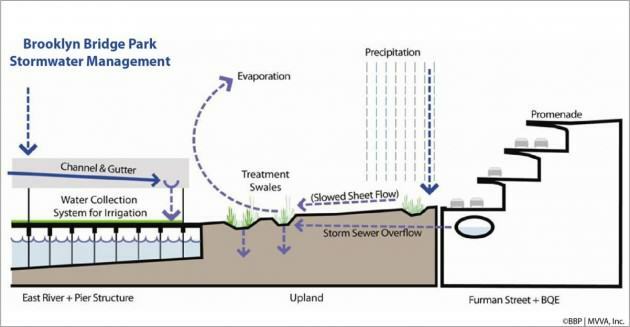 Portland and Seattle were among the first cities to use GI to capture storm water runoff in vegetated bioswales. 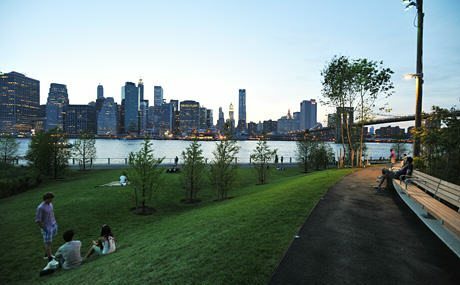 New York City’s “PlaNYC” and the “Greenworks Philadelphia” were among the ambitious plans developed under the leadership of Mayors Bloomberg and Nutter in the first decade of this century. And many of those same cities were also confronted with having to clean up their storm water runoff to address federal Clean Water Act violations and consent decrees governing the management of storm water and combined sewer systems. The combination of proactive plans for sustainable cities and ways to comply with consent decrees also led to cities developing plans for storm water management that included heavy GI components. 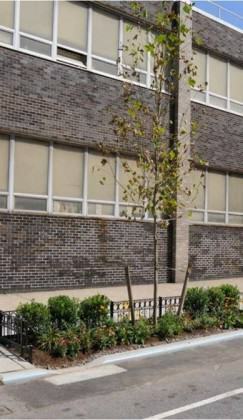 In New York City, a “Green Infrastructure Plan” was developed by the Department of Environmental Protection, and $1.6 billion was allocated toward the development of GI, from green and blue roofs to water cisterns, bioswales, “Blue Belts” and even small traffic islands, known as “Greenstreets” and specially designed tree planting systems, known by the cumbersome title of “Right of Way Street Tree Bioswales.” This commitment by the city represents an unparalleled opportunity to redefine the urban landscape, especially if traditional design approaches and cumbersome regulations and procurement processes can be energized and streamlined. 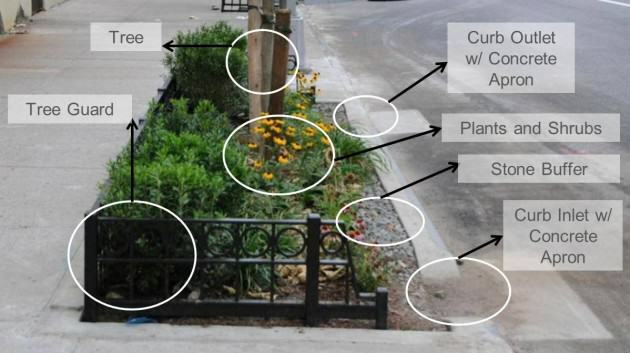 Diagram of Street Tree Bioswale. As city officials across the country address storm water runoff issues (there are at least 770 cities in America with combined sewer systems, and more than 60 of them have consent decrees with the EPA and/or state regulatory agencies), many are also struggling to find funds to build and maintain parks and open spaces, or to plant and care for street trees. In many of those same cities, enterprising landscape architects, park agencies, and community-based organizations are developing novel approaches to address both issues. In New York City, landscape architect Susannah Drake and her firm, Dlandstudio, have developed a plan to capture and process storm water runoff in street end “Sponge Parks” before it enters the heavily polluted Gowanus canal—construction for the first of these should begin this year. The design itself is complex, but even more complex are the layers of governmental agency oversight and approval involved in the project (see image below). Construction is also essentially complete on a prototype system Dlandstudio developed with the help of the Regional Plan Association to capture and phyto-remediate runoff from an elevated highway in Queens above a creek that flows through Flushing Meadows-Corona Park. Mapping complex regulatory responsibilities along the Gowanus Canal, New York. Credit: DLand Studio. On Brooklyn’s formerly industrial waterfront, landscape architect Michael Van Valkenburgh has designed Brooklyn Bridge Park as the ultimate sustainable park, with among other things hills constructed of stone recycled from a nearby tunnel-digging project, and a vast underground water storage system that captures storm water in the landscape for irrigation purposes (his landscape also performed admirably when much of the park was inundated with saltwater by storm surge from last fall’s disastrous “Superstorm Sandy.” In Queens’ Fort Totten Park, landscape architect Nancy Owens created a new park landscape in a vacant site of former army housing, designing a vegetated bio-swale which absorbs and channels storm water runoff away from structures, and creates an enriched park habitat. In many other projects, Parks Department landscape architects and architects are designing even humble playgrounds with a large array of sustainable elements, following the guidelines they helped develop. 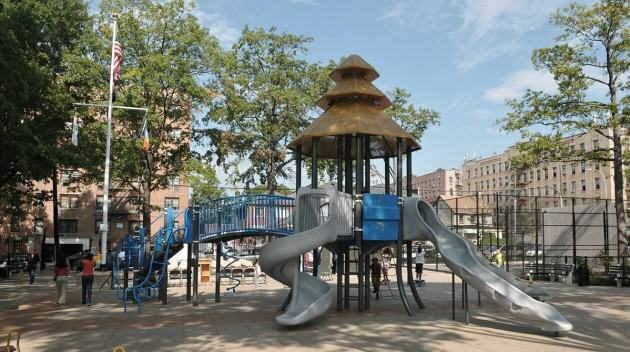 For example, the redesign of a classic 1940s playground in the Bronx, known as Pearly Gates Playground (so named by former parks commissioner Henry J. Stern in honor of St. Peter’s church across the street), landscape architects Stephen Koren, Nette Compton, Patricia Clark, and Jim Mituzas reduced the impermeable surfaces by at least 25 percent, using permeable pavement and bioswales to capture storm water, along with other sustainable materials including recycled glass and asphalt and high ash content concrete. 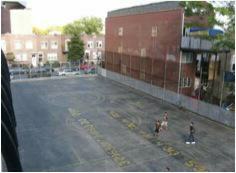 A similar program is under construction in New York City, where the NYC Department of Environmental Protection and the Department of Education are providing crucial GI funding for the projects that will allow the Trust for Public Land to transform similar poorly functioning, part-time schoolyards into attractive, multi-functional, fulltime playgrounds. Led by Melissa Potter Ix, the landscape design firm Siteworks partners with Trust for Public Land Project Director MaryAlice Lee to manage a three-month community design process at each site, then works to create plans that direct storm water runoff into rain gardens and linear tree pits; water is also collected using porous pavers and in synthetic turf playing fields. And each site is designed to collect the first inch of rain water from every storm, which covers most typical rain events. 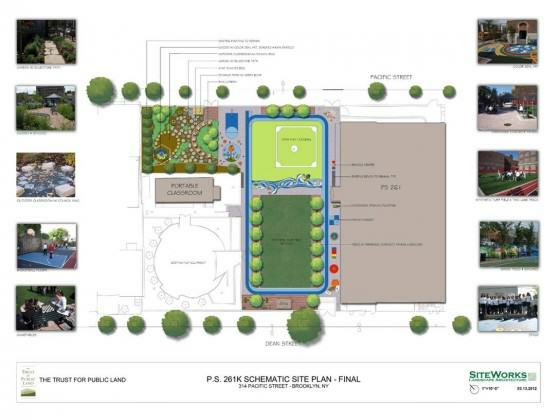 Cities large and small, across the nation, are now considering using playgrounds as part of their storm water management strategies, in which GI use is encouraged by the EPA and state regulatory agencies, and in some cases compelled to do so as part of the consent decrees. 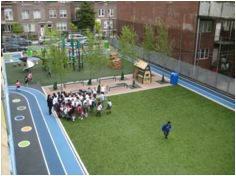 No open space is too small to contribute environmental value. In a perfect evocation of ecologist Rene Dubos’ admonition to “Think globally, act locally,” New York City Department of Environmental Protection allocated funding to the Parks Department to transform striped and paved traffic islands into “Greenstreets.” The idea of turning formerly paved areas into small gardens is not new—it was pioneered by then-Parks Commissioner Henry J. Stern and his fellow Department of Transportation Commissioner, Ross Sandler, in the 1980s, following a plan devised by DOT Deputy Commissioner for Planning David Gurin. Approximately 2,000 of these esthetically pleasing transformations were effected over the course of two decades, but the latest GI spin has the Greenstreets being designed to capture the storm water from the surrounding streets in specially designed systems with lush planting beds populated by plants that can tolerate both inundation and drought, along with the other indignities of urban street life, such as salt, contaminants, and dog waste. These hyper-performing landscapes are tiny by park standards, but they bring beauty to formerly barren corners, serve as mini habitats for insects and birds, and most of all, soak up storm water. Moreover, these steps are only the beginning of efforts to abate the increasing “heat island effect” that global warming is bringing to our nation’s cities. During Hurricane Irene two years ago, one of the first generation GI Greenstreets captured 25,000 gallons of storm water, and a corner notorious for flooding during normal rain events did not flood. Emboldened by the success of the Greenstreets, DEP Commissioner Carter Strickland is now working with his Parks and Transportation colleagues to turn the humble street tree planting pit into a “Right of Way Street Tree Bioswale.” These planting beds are much larger than normal, five feet by twenty, and ten feet deep, with structured soil and drainage materials and infrastructure, with a tree in the middle, and a variety of shrubs and ground covers. Inlets from the street usher in the storm water from the curb, and each bioswales is designed to capture 3,000 gallons of water per rain event. Best of all, perhaps, the DEP is also funding the Parks Department crews that maintain both the Greenstreets and Street Tree Bioswales, addressing one of the essential reasons—chronic lack of maintenance funding—why many city park systems don’t embark on creating new parks and public spaces, no matter how small. While the GI/parks projects in New York City and Philadelphia are among the largest and most comprehensive currently under development, other cities are also embarking on ambitious projects. 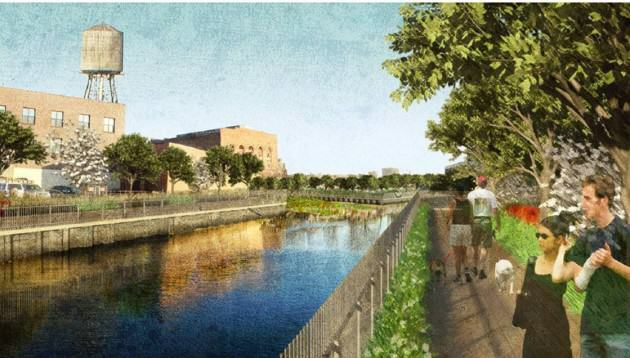 In a plan that will restore Olmsted’s Back Bay Fens of the 19th century, the City of Boston is in the first phase of a $93 million project to restore the 3.4 mile Muddy River and its shorelines, to alleviate flooding, restore the riparian habitat, and “daylight” parts of the watercourse that have been hidden in huge culverts for decades. And Washington, DC is commencing a $2.6 billion Clean Rivers Project, including GI/park projects, to comply with a 2005 EPA consent decree. Already Canal Park is being recognized or its innovative stormwater management, and the National Mall too will become a GI player in the Long Term Control Plan, as the Mall is renovated for the first time in 40 years. Bellevue, Washington, was an early pioneer in a stormwater management partnership between the water district and parks department, where the “Utility” purchased the land and built stormwater management features, and the Parks department built and maintained recreational facilities at each location—where a stormwater vault was built, the Parks would place a tennis court over it; and a stormwater detention basin would also function as a soccer field. In New Orleans, The Trust for Public Land has worked with local officials to acquire a significant first portion of land that will eventually be part of a 3.1 mile “Lafitte Greenway,” a trail running from the French Quarter to Lakeville near Lake Pontchartrain. 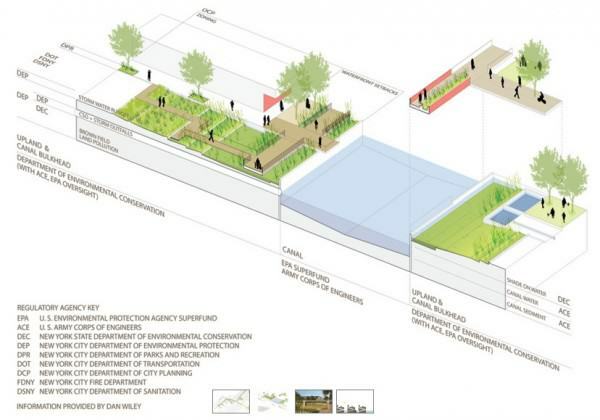 A design developed by landscape architect Dan Waggoner envisions not just a traditional bicycle path, but also a complex series of green infrastructure interventions that would help the City of New Orleans manage storm water runoff—a crucial issue for this low-lying city with a history of flooding. In Los Angeles, city officials are likewise looking at the many miles of impervious alleys to transform them into “Green Alleys” where light colored pavement could help alleviate the urban heat island effect, and planting beds could serve as rain gardens to capture storm water. And Chicago is successfully moving forward with its own Green Alley Program, introduced in 2007 to convert more than 1,900 miles of asphalt and concrete public alleys to 3,500 acres of permeable paving, with the goal of reducing stormwater by 80%. And while green infrastructure has mostly been defined as a natural approach to storm water management, increasingly landscape architects, engineers, geophysicists, planners, and officials are considering natural approaches to creating both barriers and mitigation zones to address the effects of ocean and river storm surge. Fitchburg, Massachusetts, for example, removed a floodwall from the North Nashua River as the first of $39 million in GI in 17 cities across Massachusetts and created a riverfront park on a former brownfields site. And even before the disastrous impact of storm surge from Superstorm Sandy on New York City, ideas had been formulated by these professionals from these diverse specialties. It is been known for years that the low lying areas of New York city would be vulnerable to storm surge damage from both wave action and flooding, that it was just a matter of time before “the Big One” hit and flooded neighborhoods, highways, subway and automobile tunnels, and other crucial infrastructure. In prescient “Rising Currents” exhibition mounted at the Museum of Modern Art in 2010, teams of local landscape architects and architects developed new approaches for addressing rising sea levels and flooding storm surges. Based on a two-year research project by the engineer Guy Nordenson, the landscape architect Catherine Seavitt and the architect Adam Yarinsky, the exhibition (curated by Barry Bergdoll) showcased what appeared to be radical thinking about how to soften the traditional hard edges of the city’s interface with its harbor waters. Among the ideas were recreating the historic salt marsh verges of the city, excavating “slips” that allowed the harbor waters to penetrate the street grid, building two-way porous streets, constructing apartment complexes in Venetian style water settings, and otherwise subverting the traditional approach to harbor waters—to build strong, rigid, vertical structures and walls, which work fine until the water goes higher than the hard edge. Now, as the city recovers from the devastation of Superstorm Sandy and considers options for preventing or mitigating the effects of both gradual sea level rise and catastrophic storms such as Sandy, officials at the highest levels of government are considering both very expensive, gray infrastructure responses including dikes, levees and barriers, but also green infrastructure approaches, including engineered salt marshes, constructed dunes, and other “soft” systems to mitigate the flooding and storm surge damage. As with the expanded flood plains created next to rural rivers that flood regularly, these green infrastructure elements can also function as parks, greenways, and natural areas, providing public space for humans and vital habitat for animals. 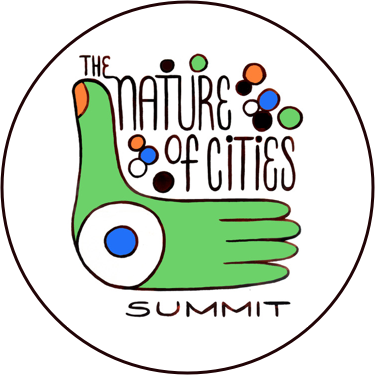 Green infrastructure as part of the solution to managing that most vital and also most dangerous of all natural forces—water—will likely be an essential component of urban design for the foreseeable future. The Trust for Public Land is working with cities across the country to research, design, and construct parks using GI, and to investigate benefits and costs. As we work to create sustainable, resilient cities, green infrastructure, with appropriate planning, will be a way to create new, well-funded, multi-functional public parks and open spaces, large and small. Acknowledgements: I wish to thank Marianna Koval, a Fellow of the Trust for Public Land, who is currently pursuing a mid-career masters degree at the Harvard Kennedy School of Government, and who is doing research on the use of Green Infrastructure in parks, some of which is incorporated in this piece. I also wish to thanks Cecille Bernstein, an intern here at TPL, who helped with the editing and organization of piece. Adrian Benepe has worked for more than 30 years protecting and enhancing parks, gardens and historic resources, most recently as the Commissioner of Parks & Recreation in New York City, and now on a national level as Senior Vice President for City Park Development for the Trust for Public Land. I live in southern Arizona near Tucson. I would like to approach the City of Tucson about ideas of developing the an abandon Grayhound dog track into a Eco-Green Technology Park. Currently the abandon Grayhound dog track is by several large recyclers and the University of Arizona Bridge Tech Park. It is a relief to see that “sustainability” can actually be put into action in a meaningful way versus applying it as a cliche for “business as usual” but painted green. It appears an enormous public undertaking to possibly balance out the negative, environmental impact of urbanization with a means to recoup natural resources. I wonder what municipal entities are doing to share the burden of environmental stewardship that also seeks shared responsibility and involvement on part of its citizenry. An example of involvement might be to provide incentives for property owners who are able to contribute green space to the community for cleaner air, improved drainage, or aesthetic reminders of nature. Where need is greatest such as highly developed & dense areas of a city, incentives increase in scale to the environmental or rebound cost. Perhaps a higher fee can be placed on disposal of garbage that dissuades consumers from making product choices that are inherently wasteful and can also pay for better waste management systems. While the public needs to know the extent of their impact on the environment, their involvement needs to be rewarded through access to nature-based spaces. Recreational use is certainly a draw to public parks, but their twofold impact needs to also be conveyed through an appreciation of open space as a significant source for sustaining city life. Reminding people that nature has a vital role is one aspect that good design and planning can have in prolonging their participation and support.